Google Search becoming better and feature rich day by day. You might have aware about Google Search Features with Real-Time Results. Many times we wonder that, what time is it in New York? What will be the weather like tomorrow? What is the current status of favourite Stock? Is flight on time? Which movie is showing in theaters today in your city? Google Search can answer all of your questions by searching right keywords. Here I am sharing six search features which display Real-Time results. 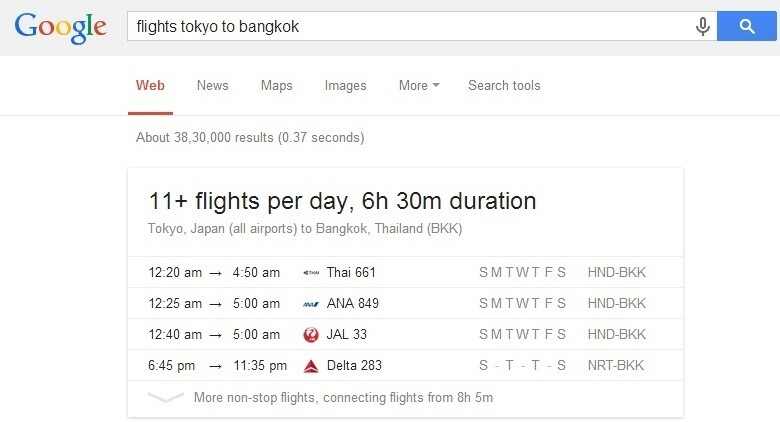 This Google Search feature is really awesome, Would you like to know what time is it in Tokyo? Ask Google, it will display current time and date of anyplace in the world. You need to type ‘time: city name’. 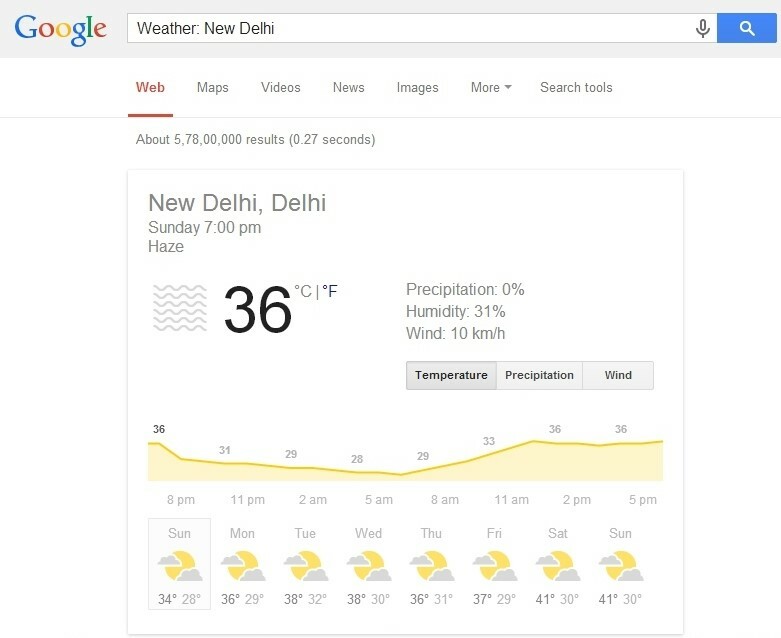 You can get Real-Time Weather update of anyplace in the world by using Google Search. You should type ‘Weather’ and place name to get current weather and forecast result. It can also be searched by using Zip Code in United States. The information provided by Google belongs to The Weather Channel, Weather Underground and AccuWeather. This Google Search feature is popular among financial investors. Google allow you to Search Quotes of Stocks listed on any Stock Exchange Market. 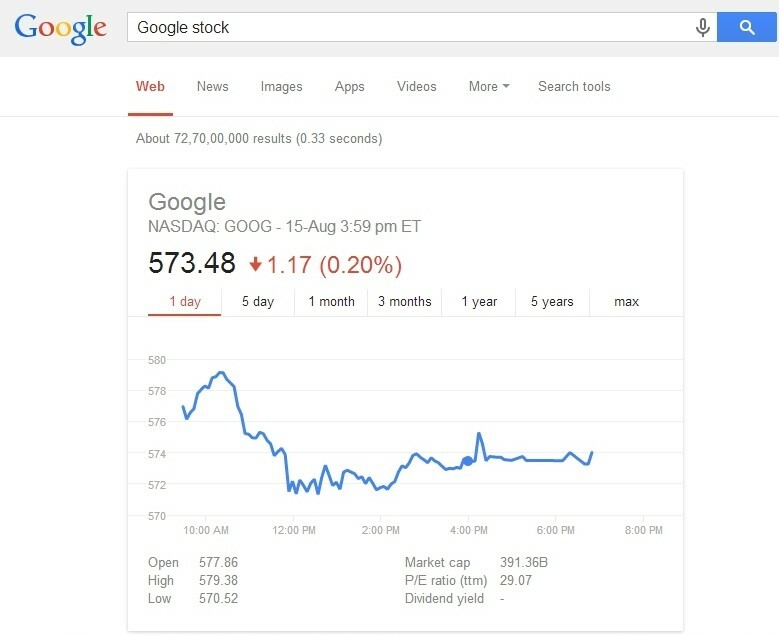 Google display results with Real-Time quotes update and also shows past performance of that stock. You need to type ticker symbol or name of the company with ‘Stock’ keyword. All the information provided in search result belongs to Google Finance. It is really easy to get Conversion of Currency from one to other with Real-Time Exchange Rates with Goggle Search like Yen (¥) to Euro (€), Euro (€) to US Dollar ($) etc. 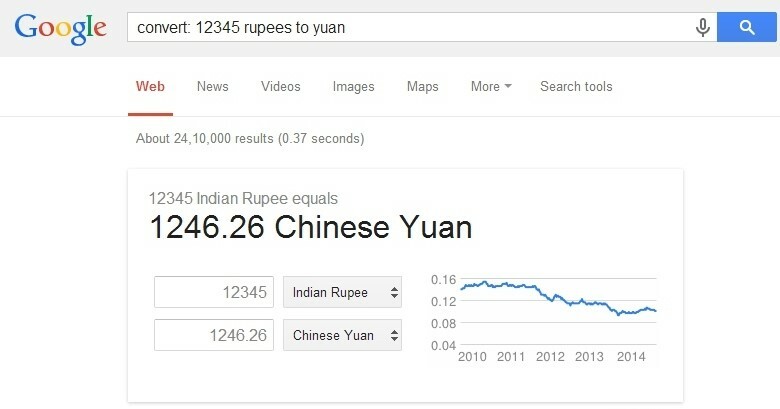 Google Search not only display Currency Conversion but it also display a Graph of last 5 years Currency Exchange Rate. Typing ‘convert: 12345’ and currency from X to Y. Which flight is going to Bangkok? 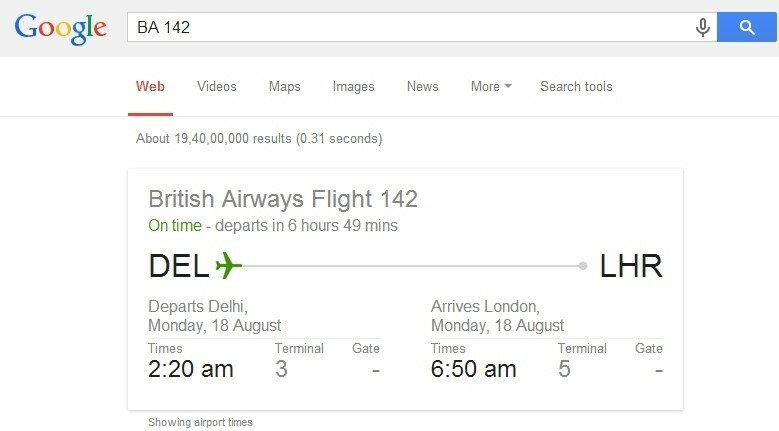 Google search also provides schedule of flights from one place to other. You can get schedule by typing ‘flights’ followed departure destination to arrival destination i.e. Flight Tokyo to Bangkok. To view schedule of a specific route, any other location can also be added with to or from. Which Movies are currently showing in theaters nearby you? Google Search can also answer this question. Search ‘Movie’ followed by your city or area name. You will get a list of movies showing in theaters with their show timings. Google will also show results about theaters nearby your location. You can also search only movie name and Google will automatically (by syncing your location, if enabled) show name of theaters and show timings, where that movie is showing. 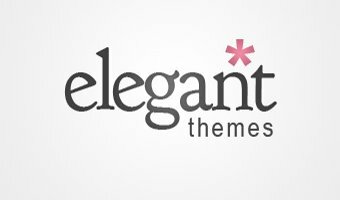 I hope you find this post useful. Give a try to these Google Search features and share your experience & suggestions about this article in comments section below.